Kiran Lyall has come up with another winner. It's a new children's book called My First Panjabi Alphabet and it's a wonderful puzzle-practice-drawing workbook. You may remember Kiran from her earlier books: Have Fun with Panjabi (Books 1 and 2) and Ria and Raj and the Gigantic Diwali Surprise. Children love story books, but even more than stories they really enjoy books they can interact with and become absorbed in such as colouring books, puzzle books and cutout books. This is one of those books. It immediately captured my interest, and you know I'm a child at heart. Each letter of the Gurmukhi alphabet is accompanied by not only an example word and its usage, but also pronunciation, writing practise and fun games that illustrate the letter, so each letter is learnt in multiple ways and the child gets a feel for the sound and the letter together. This is the way to embed the memories so that reading Gurmukhi can begin. 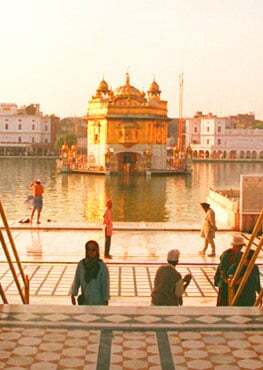 I still remember being at Sikhi Camp in Bangkok with about 300 children of all ages. Those who were learning their aakri were so proud. One of the girls who must have been about six years old, had a card with the letter gagga on it worn proudly around her neck on a piece of yarn. She asked me "Can you read Gurmukhi?" and when I replied, she pulled it out and said "okay then, what letter is this?!" Kids want to learn. Gurmukhi is a phonetic alphabet and makes a lot more sense linguistically than a language like English where the letters represent different sounds at different times. I mean silent consonants? "Knife?" How much sense does that make? Gurmukhi is a lot easier. Your kids will love to learn how to read and write Gurmukhi with this workbook. "This book came about mainly because of the feedback I received from my earlier Have Fun With Panjabi books. Parents wanted the next stage up. A book that would engage children who have little or no knowledge of the Panjabi/Gurmukhi script. A book that could prepare them for when they go to Panjabi school or could even be used for beginners at Panjabi school. I personally love workbooks and puzzlebooks, and this love has followed through with my eldest son. So I thought why not produce a workbook that will teach the alphabet through practice and puzzles? All of my four books have been a collaboration with Venisha Sudra. We were introduced through a mutual friend. Her fabulous illustrations bring my work alive. It is great to work in a partnership where we understand each others work/likes and dislikes without having to say too much. Her work always astounds me, especially when she created the original Gurmukhi font for this book even though she is a non-Panjabi speaker. The most difficult part about producing this book was achieving the best possible spelling to indicate the correct pronunciation. Unfortunately this will never be perfect without the use of audio. The words in the book were tested with a focus group of non-Panjabi speaking adults and children and the spelling that achieved the closest pronunciation was used." All of Kiran's children's books are available at her website.